A British Airways plane carrying 343 passengers and crew including Tony Blair and his family has overrun the main runway at Miami Airport. No-one on board the Boeing 747-400 plane was injured after the incident. 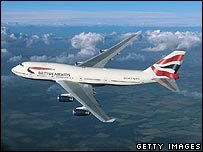 BA said the pilot could not see the lights leading to the taxiway - causing him to hit more lights - and the plane had to be realigned. Mr Blair was on his way to stay with Bee Gees star Robin Gibb at his house in Miami Beach. The prime minister was seated in first class on flight 209 from London, which landed at 1815 local time (2315 GMT) on Tuesday, the US Secret Service said. "The captain believed the lighting on the taxiway was not sufficient to guide him and an airport vehicle was requested to realign the plane," a BA spokeswoman said. According to Federal Aviation Administration spokeswoman Laura Brown the plane stopped just past the end of the runway. "It landed safely on the runway. It slowed down. It was going at taxiway speed and they just missed a turn," she said. Airport spokesman Marc Henderson said the jet had hit several airfield lights after landing but had not left the concrete surface. Evan Benn, a reporter for the Miami Herald newspaper, told BBC News Mr Blair was holidaying in Florida. "The prime minister and his family are staying with Robin Gibb, the former Bee Gees star, who has a $10m [£5.1m] house here in Miami Beach," he said. Downing Street confirmed Mr Blair was on his winter holidays but said it never commented on specific arrangements.